Since most of us working with Exchange have – directly or indirectly – to do with virtualization technologies, we would like to inform you Microsoft published a Windows Server 2008 R2 Hyper-V architecture poster, much like they did for Exchange 2007 (no sign of Exchange 2010 versions yet). 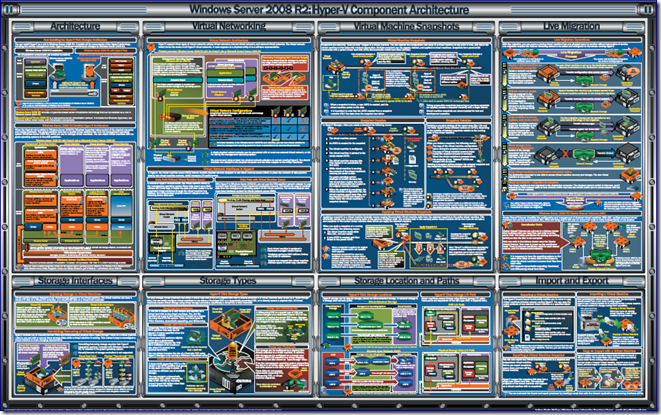 This poster – in PDF format – is a nice reference for key Windows Server 2008 R2 Hyper-V technologies. It focuses on subjects like networking, storage, live migration, snapshotting and management. This entry was posted in Hyper-V and tagged Hyper-V, Virtualization by Michel de Rooij. Bookmark the permalink.